A James Clifton double ensured the Reds dispatched an in-form Buxton 2-0 in a well fought Derbyshire Senior Cup quarter final at the Impact Arena, on Tuesday night. Billy Heath made four changes to the side from Saturday's shocker against Spennymoor, with Nathan Hotte partnering Luke Shiels at centre back, Curtis Bateson and Tom Platt also came into the side. Josh Wilde and Jordan Sinnott returned to the bench. The two sides traded possession in the early stages with both looking to control the midfield, Richard Peniket earned a early corner which was taken by James Clifton short to Platt whose shot was blocked. Omotola looked to break for Buxton but David Lynch tackled him well. Peniket had the first effort of the game, curling wide of the post from outside the box. Reece Styche then tested Roberts in the Bucks goal with the goalkeeper palming away the Reds striker's deflected strike. The Reds were composed on the ball and started the game well with good pressing and good battling throughout. Another good move saw Tom Allan find Peniket who nodded towards Clifton, but the midfielder could only fire over the bar inside the box. Alfreton were getting closer and good defending denied Styche connecting with Bateson's near post cross. Luke Shiels would then head the resulting corner just wide. Allan then headed wide for us after a Clifton free kick, before Peniket was judged offside despite hitting the post from Clifton's brilliant left wing cross. The banter was flowing between Styche and the Bucks management staff who had several exchanges after decisions and fouls with a tasty battles growing through the game. Buxton rarely threatened in the first half as the Reds continued to attack, Styche fired wide from just outside the D, Shiels header then trickled wide from Allan's free kick which Styche came close to connecting to at the far post. The Bucks only real dangerous moment came when Oli Roberts curled a powerful free kick all the way into Sam Ramsbottom's arms from distance in a mostly dominant first half for Alfreton. The second half saw Peniket pick up a knock and had to be replaced by Craig Hobson after just 50 minutes. Bateson fired way over the bar after a good run before the pressure did finally toll on 59 minutes. Bateson whipped a cross in from the right which found Clifton and he finished via a deflection into the bottom corner. The opener was deserved for the Reds who had been pushing and their recent efforts had finally been rewarded. Roberts tipped Hobson's drive over the bar with a scramble occuring from the resulting corner, Styche would fire wide of the post with our handball shouts being waved away. On 72 minutes we doubled the lead as Clifton was again found by Bateson who got into a great position with some neat skill; Clifton's shot went in off the far post to give us clear daylight in the contest. Styche gave way for Jordan Sinnott as we saw the final stages of the game out professionally, Allan headed straight at Roberts when well positioned from a corner, Platt's low strike was well held by the Bucks keeper after another quick move from us on the edge of the box. 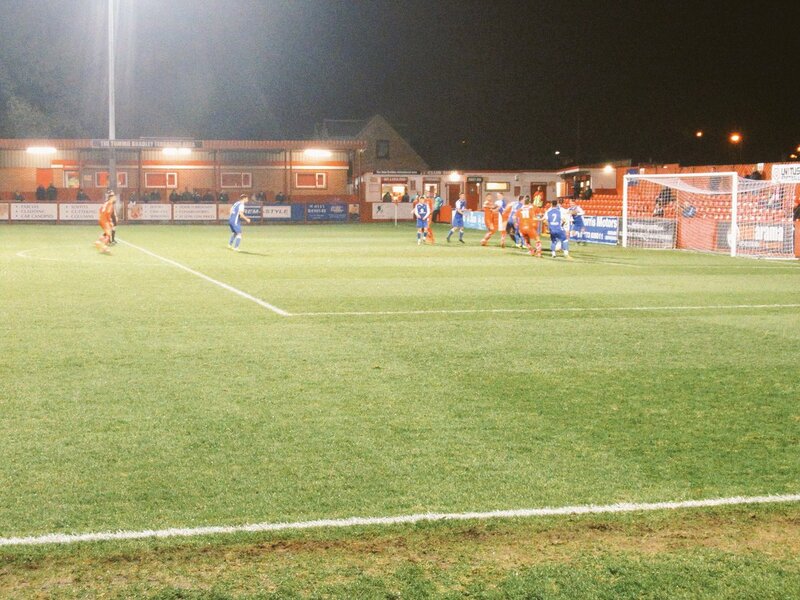 But the Reds sealed their spot into the semi final and a trip to Matlock Town in early January. It was the perfect reponse to Saturday and a positive reaction and a good all round performance against a in-form Buxton side. The Reds will be eager to use Tuesday's result to kick on again in the season, with the visit of Stockport County in nine days time; it's a free Saturday for the Reds with no fixture this Saturday. ATFCXI: Ramsbottom, Clackstone, Allan, Lynch, Hotte, Shiels (c), Clifton, Styche (Sinnott 77), Peniket (Hobson 50), Bateson (Chettle 87), Platt. Subs Not Used: Nicholson, Wilde.